Fig. 1. Time-of-flight mass spectra of ionization products of Xe atoms and clusters. The kinetic energy of ions as a function of the charge for N=1500 is displayed in the inset. Fig. 2. Time-of-flight mass spectra recorded after irradiation of Xe clusters comprising 1500 atoms as a function of power density. Fig. 3. Classical simulations of the electron motion and ionization for Xe13 clusters due to irradiation with IR light and soft x-rays. Electron trajectories were calculated for 100 fs long pulses of constant intensity. The position of the electrons is shown 10, 20 and 100 fs after the onset of a light pulse, which is polarized in z-direction. 1 Hamburger Synchrotronstrahlungslabor HASYLAB at Deutsches Elektronen-Synchrotron DESY, Notkestr. 85, D-22603 Hamburg, Germany. 2 LNLS 13084-971 Campinas SP Brazil and IFGW-UNICAMP 13083-970 Campinas SP, Brazil. 3 Deutsches Elektronen-Synchrotron DESY, Notkestr. 85, D-22603 Hamburg, Germany. 4 Joint Institute for Nuclear Research, Dubna, 141980 Moscow Region, Russia. * present address: Lehrstuhl für Physikalische Chemie II, Ruhr-Universität Bochum, D-44780 Bochum, Germany. Fourth-generation light sources based on free-electron lasers (FEL) will be a source of intense, short-wavelength radiation for a range of applications, including biological imaging. The first results reported on December 5, 2002 in Nature, from experiments with the FEL at the TESLA test facility at DESY shed light on the interaction of short-wavelength, short-pulse radiation with matter. 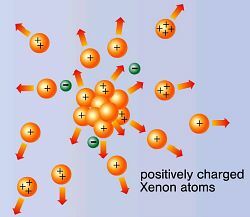 Here, unexpectedly strong absorption of the laser radiation by Xenon clusters was observed, resulting in the explosion of the clusters and the ejection of high-energy, multiply charged ions. Such a highly nonlinear interaction between matter and soft X-rays below 100 nm has never been seen before. Intense radiation from lasers has opened up many new areas of research in physics and chemistry and has revolutionized optical technology. So far, most work in the field of nonlinear processes has been restricted to infrared, visible and ultraviolet light. Short-wavelength FELs allow now initial experiments with intense pulses that could be used to obtain deeper insights into the structure of matter. Here, we present initial results from a study of the interaction of soft X-ray radiation with Xe atoms and clusters . A pulsed beam of atoms and clusters was illuminated with ~100-fs-long FEL pulses at 98 nm wavelength focussed into a small spot (20 μm diameter) and a power density of up to 7*1013W/cm2. Xenon atoms and clusters are chosen because they can be ionized even by single 12.7 eV photons (the ionisation potential of Xe atoms is 12.1 eV). The resulting ions are detected with a time-of-flight (TOF) mass spectrometer. TOF mass spectra for different cluster sizes recorded at 2*1013W/cm2 are shown in Fig. 1. The most striking result is the surprisingly different ion signal from atom and cluster beams. Whereas only singly charged ions are observed after irradiation of isolated atoms, atomic ions with charges up to +8 are detected if clusters are irradiated. Clusters absorb many photons and completely disintegrate into singly and multiply charged ions. The mass peaks are very broad, indicating that the ions have a high kinetic energy. For Xe7+, kinetic energies of more than 2 keV were observed. In small clusters, the kinetic energy increases quadratically with the charge state (see Fig. 1 inset). This behaviour is a clear signature of a Coulomb explosion. On average, each atom in large clusters absorbs up to 400 eV, corresponding to 30 photons. The population of different ion states and their kinetic energy strongly depends on the power density. This is shown in Fig. 2 for clusters comprising 1500 atoms. The strong dependence on the power density is a clear sign that optical nonlinear processes dominate the ionization of the clusters at the power levels used. The dramatic effects observed in the experiments when clusters are exposed to short-wavelength radiation are somewhat surprising because Coulomb explosion starts at 1011 W/cm2; this is much lower than the power density needed to induce Coulomb explosion at longer wavelength in the infrared (IR) . Moreover, the well-understood classical models that describe the absorption of energy (inverse Bremsstrahlung) and the electron emission (field-ionization) of clusters illuminated with high-intensity IR-laser pulses seem not to work in the short-wavelength limit..
We assume that quantum-mechanical modelling, which includes resonant intermediate states, is needed to explain the efficient energy absorption seen in the experiment. On the other hand, the classical simulation presented in Fig. 3 clearly shows that electrons can leave the cluster by a photon-assisted isotropic thermionic emission and field ionization, the dominant ionization process at optical frequencies, does not contribute to cluster ionization. In summary, the results show that short wavelength FELs open new experimental opportunities.